As an example of threefoldness of carnivores we will discuss dog and cat and their relatives wolf, red fox and lynx. We will follow Schad's Mammals and man. The carnivores are characterized in a threefold way as the heart-lung animals (see: mouse - lion - cow). When we go to a farm, the first being we meet is the dog, who sees us coming from afar. 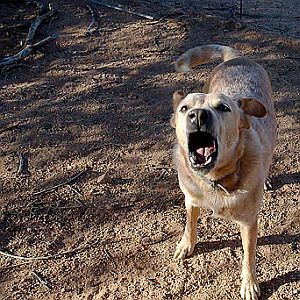 It comes directly towards us, barking and perhaps trying to jump at us as well. This may be unpleasant or pleasant, depending on the character and upbringing of the dog and the relationship we have with it. As we walk to the house, the dog will accompany us, either leading of following and eager to know what will happen. As we approach the house, the dog may bark louder, trying to defend its territory. It often tries out who's in control: itself or we. Once we have been invited in by the farmer or his wife, when we have hung our coats and are drinking a cup of coffee, we become aware of the cat, dozing in a corner or next to the stove. It may come to us for a hug, or to sit on our lap. It will not seek us out; it shows signs of activity only after we have been in the house for a while. This brief description clarifies some differences between the dog and the cat. The dog is outside a lot and roams the yard or the area that it is granted (by the boss or other dogs). 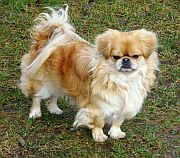 It walks along the perimetre, guards the grounds and barks when an unknown person enters. If it recognizes someone the greeting can be friendly or sometimes unfriendly. A dog tries to see who's the boss: it or we. When it is given a command, the dog follows it and often will not let go. A dog is not often in the house, mostly just to eat and rest (in its own basket). Dogs that live inside, are walked (on a leash) by their owners several times a day. A dog is easily trained, it can learn a lot and is a social animal. A cat, given the choice, will go out a lot, too, but only when it wants to. A cat is not walked on a leash. 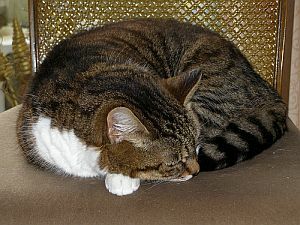 For hours on end a cat may lie curled up, dozing in a self-selected warm spot. It will not let itself be limited by its owner or by other cats, although it will defend its territory. 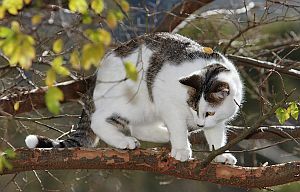 Regularly you may find a cat in a tree or on the roof. It catches mice and other animals that it takes inside. Sometimes it wants to curl up on our lap. A cat can hardly be trained, it remains itself. By nature it is a solitary animal. It is said that a cat allows you to live with it and also: a dog has a master, a cat servants. The dog was domesticated from the (gray) wolf. It is likely that domestication took place approximately 15,000 to 30,000 years ago in East Asia, when man gave up his nomadic existence, settled and became a farmer. 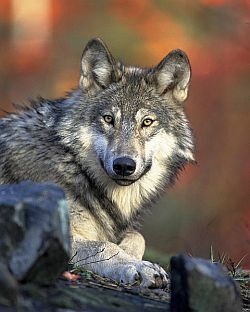 At that time wolves started to seek the proximity of man and to eat from the food they wasted. 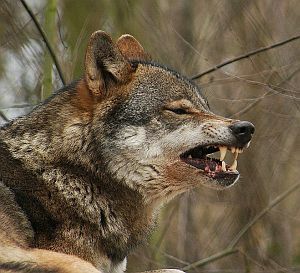 Wolves howl when an enemy approaches, so they also protected the farmers. They tamed the wolf and the wolf adapted to the farmers. 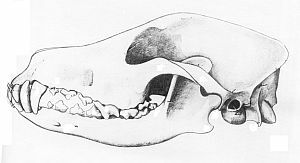 During domestication, the facial skull became shorter. 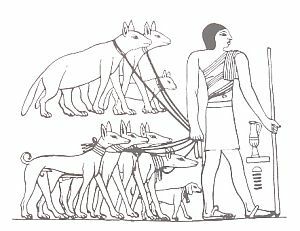 In ancient Egypt dogs were often used for hunting. Even species that we no longer know as domesticated nowadays, such as cheetahs and hyenas, were held by the Egyptians. Until 100 years ago dogs had to stay outside, where they slept in doghouses. Especially in the last 200 years an explosive multiplication of breeding varieties has taken place. Dogs have retained the social characteristics of wolves. They have a social hierarchy, the pack, in which the place of each animal is fixed. Because of that, dogs listen to their masters. 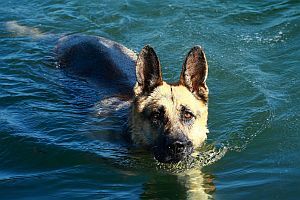 And dogs can learn a lot and adapt to many situations. 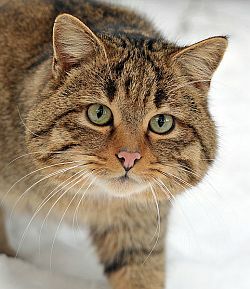 The cat was domesticated from the (African) wildcat. 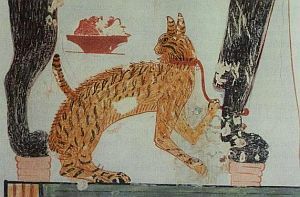 Domestication occurred in Asia Minor, about 10,000 years ago. Cats were probably attracted by mice, who did well on the grain of the newly settled farmers. The farmers took kittens as pets in their houses and took care of them. The cats got used to being fed by people and they domesticated themselves. 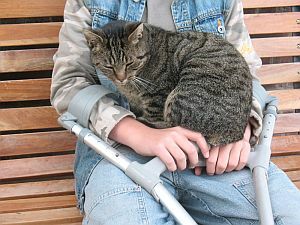 During this process the cat became tamer, but did not change anatomically, nor its behaviour. 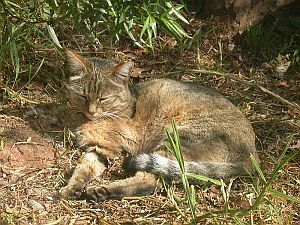 Feral cats can easily survive in the wild. Dogs are domesticated, cats domesticated themselves. Through its social behaviour the dog is focused on its master and wants to serve him. The cat moved in with man. 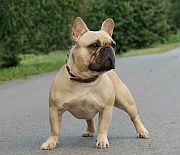 The many different breeds of dogs differ much more among themselves than breeds of cats. Cats are what they are, they do not change. Dogs respond to selection. There is a wonderful story by Rudyard Kipling from his Just so stories about the cat and the dog (and the horse and the cow) called The cat that walked by himself. 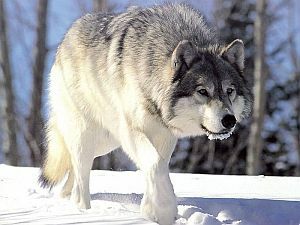 A wolf is about 130 cm long, its shoulderheight is about 75 cm and it has a tail of 40 cm. It weighs about 50 kg (all sizes and weights are averages). The fur is gray-brown, darker on the back and pale gray underneath. The colour is variable; light and dark subspecies occur. There are 39 subspecies. A wolf has a remarkably long body. Both head and skull, chest and tail are long and narrow. The tail is held quite straight and is not very flexible. The head is held high. It is fairly high on its legs and the legs are quite apart from the body. The legs with their relatively large, hard, non-retractable claws are well suited for running. Wolves do not run silently. They have an excellent sense of smell. They smell one million times better than we do and they can perceive in which nostril the scent is stronger and thus from which direction the scent comes. Smell gives a quick response because there is a direct connection with the brains. The smellbrains of a wolf represent approximately 10% of the brains (in humans 1%). Because the smell is so strongly sensed, wolves are led by their smell. Their hearing is also well developed. The sense of sight is aimed at moving objects, and they do not see red. Their color spectrum is shifted towards blue-violet, compared with man. Taste is not well developed. A dog has a bigger heart and much bigger lungs than a cat. 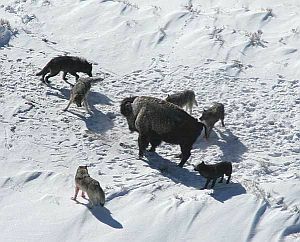 Wolves are carnivores and hunt medium to large animals such as deer, elk, wild boar, sheep and ibex. Smaller animals like rabbits and mice are caught, too. They start eating the viscera and organs, followed by the muscles. In times of scarcity wolves will also eat carrion and sometimes manure. Plants and berries are eaten as supplements to the diet. The digestive tract of wolves is 5 to 6 times the body length. The blind gut is 8 to 30 cm long, much longer than that of the cat. The jaw is relatively long. The canines are heavy and rather short. Besides carnassials there are a few molars, that are blunter as those of wildcats. A wolf hunts on scent, stalks its prey and tries to pounce on it. If that does not succeed, it will pursue, usually no more than a few km. The pack can also hunt indefatigably, but rarely does. Wolves have great endurance. They like to swim. Wolves live in packs - family groups consisting of one male and one female with their offspring. The pack lives and works together, all members help each other when hunting. There is hierarchy in the pack; only the leading animals can reproduce, although the lower-ranking animals will seize the opportunity if it arises (when the leading animals are out of sight). The lower animals are resigned to their subordinate position. It is on this fact that the coexistence of dogs with humans is based. A dog recognizes its master or is its own. If leadership is not clear, it must be established over and over again. 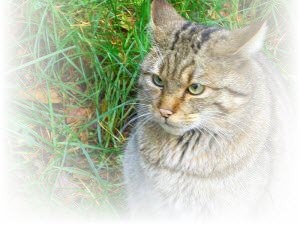 The European wildcat is a grey, lightly striped animal of about 60 cm long with a shoulderheight of 35 cm. The tail of 30 cm is relatively long. It weighs 6 kilos. There are five subspecies. The body is agile. 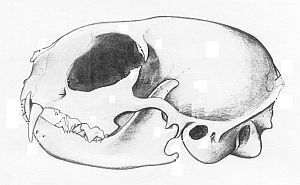 The skull is oval-round. A cat has relatively short legs, that are somewhat inside the body. Cats move stealthily and stalk well. They sprint and run for short distances only. Their claws are retractable and the pads of their feet are soft and sensitive which is why cats move inaudibly. The tail is flexible and often moving. Cats have a very good sense of hearing, one of the best among mammals. The range is more than 10 octaves and goes higher than that of dogs. They can hear the ultrasonic sounds rodents make. The good hearing is enhanced by the movable ears. The sense of sight is strong too. They see well in the dark, because the light is reflected in their eyes. Cats are red-green colourblind, and they see moving objects best. 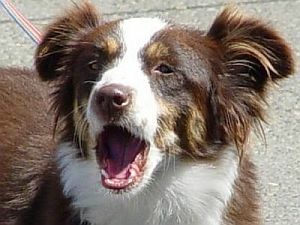 The sense of smell is better developed than in humans, but less than in dogs. They have long whiskers on their heads, with which they register the flow of air. Their sense of balance is also well developed. They climb trees well and run effortlessly along thin ridges and branches. Cats eat pure animal food: fresh meat and fish. They do not touch rotten meat, nor eat carrion. Plant-material is eaten via the gut contents of prey. Sometimes cats eat grass. They hunt mainly small birds and rodents, such as mice. A cat has a very short blind gut (2 to 4 cm). They have sharp carnassials in the jaw, which is shorter than that of dogs. Cats have 2 molars per half jaw less than dogs (the simplified formula for the cat is: 3-1-3-1, and for the dog: 3-1-4-2). Prey is mostly hunted through stalking. When a prey is sighted, the cat stands still and can focus on it for a long time. From standstill or from an ambush the cat jumps on its prey. The reflexes are fast. A cat is a good jumper. It is a good climber, too, and comes down again half sliding and falling. They can survive falling over great distances. During the fall the legs always turn down. It is said that a cat has nine lives. Cats learn to hunt from their parents. The mothercat in our house came in with a dead bird in her mouth when the kittens were a little over 6 week old. She paraded in front of her kittens, put the dead animal down and kept watching. At first the kittens were not interested, but after a while one went over and tried to get a hold on the bird. Without result. A while later, another kitten tried it and began to pluck the bird and began to eat a bit of it under the approving eye of its mother. After that the mother brought in more prey, usually mice, sometimes a bird. When the kittens were 9 to 10 weeks, we heard a shriek. A half-dead mouse was brought in and the kittens played with it and killed it. After that more half-dead mice followed, and a half-dead frog and a squeaking bird. When the kittens were about 12 weeks, livings birds were brought in. It was certainly intended that the kittens should kill them, but they got no chance, as we rescued them and let them free again. Outdoors the education goes on, not in our field of vision, alas. Wildcats educate their kittens in the same way, their task in hunting prey increasing. Wildcats are animals that go their own way, for the most part they live solitary. They spend a lot of time grooming themselves and getting clean. Cats have a larger brain volume, a smaller heart and smaller lungs than dogs. The digestive tract is shorter and the stomach is bigger. The blind gut (cecum) is very short. Cats have a lighter skeleton. 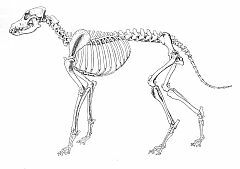 The skeleton of a dog (left) and a cat (right). The skeleton of the dog is straighter, that of the cat more roundish (skull, spine, bent legs). The dog keeps its head higher than the cat. Dogs and cats are carnivores, animals that can be characterized as rhythmical or heart-lung animals (see mouse - lion - cow). A cat stays itself, goes its own way, is obstinate and keeps its form through domestication. 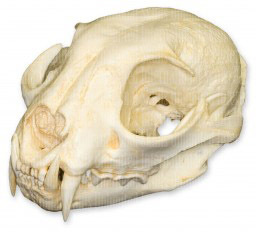 With the cat the roundness is visible: a round skull, a round and agile body and tail and retractable claws. There are but a few subspecies. Everything seems to come from a centre. 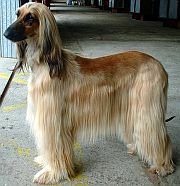 A dog is open to its surroundings, is focused on its master, can learn and we see much variation in breeds. The straightness is visible: a rather rigid body and tail, non-retractable claws, not very agile. A dog seems to react to what comes from the surroundings. Everything seems to come from the periphery. When dog and cat are compared, we see that a cat lives out of its heart and a dog out of its lungs. As the heart responds to inner feelings and the lungs to what comes to us. carnassials and not so sharp molars, longer digestive tract. We see also that the small cat climbs trees and the big dog/wolf likes to swim. 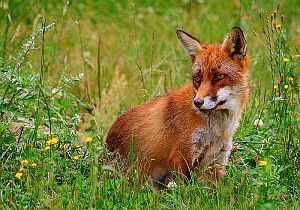 A relative of the wolf in Europe is the red fox. A red fox is 70 cm long, with an extra 40 cm for the thick, bushy tail, which is straight when the fox is moving. The shoulder height is 35 cm. On average foxes weigh 6.5 kilo. Their colour is red-brown with a white underside and white around the mouth. The lower parts of the legs are partly black. There are 45 subspecies. 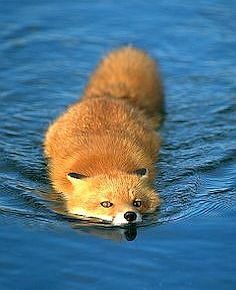 The body of a red fox is relatively long, compared to the wolf. The snout is slender and elongated. The tail is long and thick. The legs are shorter and the claws are relatively smaller than those of the wolf. The claws can be partially retracted. The heart of a red fox is relatively bigger than a wolf's heart. The sense of hearing is well developed, the squeaking of a mouse can be heard from a distance of a 100 meters, the flying of crows at 250-500 meters. They see well, but are mainly focused on moving objects. They have a good smell, but less developed than that of dogs. The canines are sharper and relatively longer than those of a wolf. The digestive tract is relatively shorter. 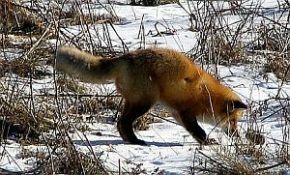 A red fox is an opportunist and omnivore. It eats beetles, mice, rabbits, chickens, eggs, fruit, carrion and garbage. Like the wolf, it buries food and goes back to eat it. A fox is a solitary hunter. It can run fast, but approaches its prey stealthily and, just like a cat, can stand at a hole for a long time, to jump on the prey when it appears. A fox is agile, hunts like a cat, and is less of a pursuer than a wolf. A fox can jump over fences of 2 meters. They are good swimmers and climb trees well. 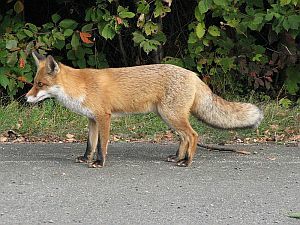 Foxes have a burrow and live in family groups of 6 animals, consisting of a leading male and female and a number of subordinate females from previous litters. The cunning of the fox is legendary. When a fox wants to go into some place, he looks around until he finds a place to go in, whether a hole in a fence or a place where he can dig a tunnel, or he will find a place where he can jump in. 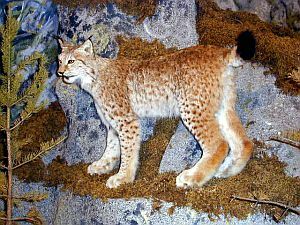 The cat has a wild relative in the wooded parts of Europe: the lynx. 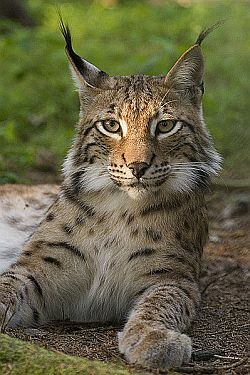 The Eurasian lynx has a body length of about 100 cm, a shoulder height of 60 cm and a short "bobbed" tail of 15-20 cm. Its weight is 22 kilo. The back is just as long as the legs, so that a lynx has a square appearance. The front legs are shorter than the hind legs. The claws are about three times as big as those of the cat. The head is round and wide, partly due to the broad whiskers. 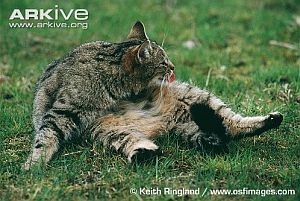 Compared with the cat, the lynx has longer legs and a significantly shorter tail. The limbs are less withdrawn into the body. There are 10 subspecies. A lynx has a light reddish brown colour with a black tail end. Scattered across its body are small dark spots. Especially the limbs are clearly spotted. The chin and underside are light coloured. The sense of hearing is excellent. The sound of a mouse is heard at 50 meters distance and a roe deer that passes by is heard at 500 meters. 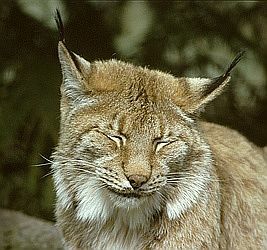 On the ears are tufts of black hair, which play a role in hearing (if they are removed, a lynx hears less and is less able to determine where the sound comes from). The eyes are the most important sense organ. A lynx can spot a mouse at 75 meters, a hare at 300 and a roe deer at 500 meters. Like cats, lynx can see well in the dark. Smell is not important when hunting. 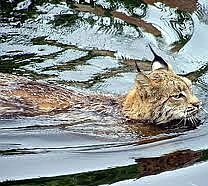 The lynx has a good spatial memory. Lynx live solitary and hunt primarily on birds, hares, roe deer and chamois. Small animals are stalked and pounced, big ones are seized from an ambush behind bushes or in trees. Large prey can be hidden and eaten from for several days. Lynx also eat carrion. They pursue more than cats to catch their prey. Chases of 200 to 300 meters of rabbits and roe deer are often surprisingly successful. Comparing wolf and red fox as well as lynx and wildcat, we see that the biggest animal has a shorter tail and relatively bigger claws. The bigger animal is relatively shorter, and of relatively bigger height. Interestingly, wolf and lynx both have relatively larger claws than red fox and cat. 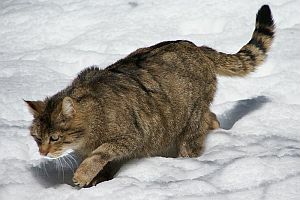 In the literature, the large claws of the lynx are explained by the snow in which the lynx moves (much more than the cat) and that the bigger claws make it easier to move about in snow. One can also reverse that. Because the lynx has larger claws it can move easier in the snow than the cat. Why do wolf and lynx both have larger claws? The lynx lives in snowy areas and the wolf often not; many foxes and cats live in snowy areas, too. It turns out there is a rule among felines and canines: the larger animal has relatively larger claws.